Out of the gate, this might seem like an odd comparison. Are you really comparing a Volkswagen against a BMW? Yes, we are. We'd like to argue today that the better use of your hard-earned money is on the 2018 Volkswagen Golf Alltrack rather than the 2018 BMW 330i xDrive Sports Wagon. Is the 2018 Volkswagen Golf Alltrack less powerful than the 2018 BMW 330i xDrive Sports Wagon? Yes. Is it less luxurious? Yes. However, how does the 2018 VW Golf Alltrack compare in the aspects that matter to its SUV-wagon mixed build? Those would be its cargo capacity and pricing. Let's find out with the 2018 Volkswagen Golf Alltrack vs the 2018 BMW 330i xDrive Sports Wagon. 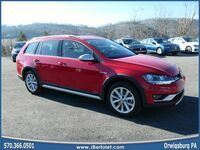 The 2018 Volkswagen Golf Alltrack presents itself as a perfect mix between a cargo wagon and an SUV, all while coming in with an affordable cost for the average driver. Interested to see how the 2018 VW Golf Alltrack feels and handles? Contact us here at the J. Bertolet VW dealership to schedule a test drive or have any further questions answered. J. Bertolet Volkswagen is located in Orwigsburg, Pennsylvania within Schuylkill County.